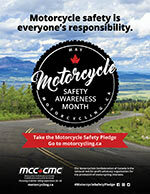 Each of us can play an important role in motorcycle safety. 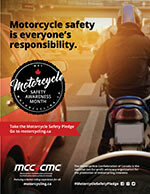 Please help to share the message that motorcycle safety is everyone’s responsibility. We have developed a variety of assets for you, or your organization, to use and share. 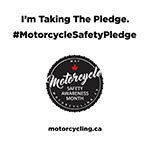 You are welcome to use the Safety Awareness Month logo, posters, graphics and messages to help spread the importance of motorcycle safety. 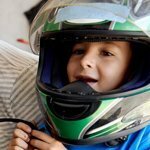 The logo can be printed as a button, decal or sticker and handed out at meetings or events. During the month of May, update your Facebook profile picture to the logo. Include the logo and posters in your next newsletter, and post them to your website. Print copies of the posters and distribute them at your next meeting. Post them at events or local community centres. You don’t need to ask for permission to use the logo, but please do not alter it. The logo is to be used as provided. If you’re looking for French versions of these materials they are available on the French site. We appreciate your support! 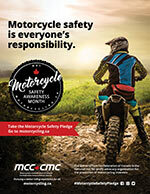 If you have any questions, please contact us at info@motorcycling.ca. Download "I'm Taking the Pledge"Download "I Took the Pledge"